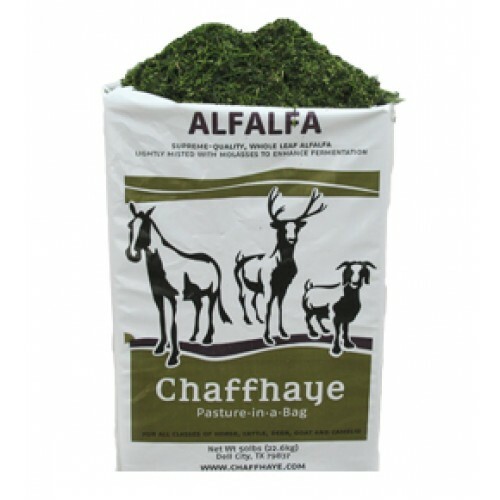 Chaffhaye undergoes a natural fermentation that transforms the raw alfalfa into a super digestible forage, enriching it with yeast, enzymes and beneficial microflora that aid digestion as well as absorption of its nutrients by the animal. 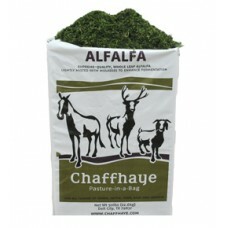 Chaffhaye Alfalfa is soft, easy to chew, and free of dust and mold. We guarantee Chaffhaye’s nutrition for 16 months from the date of manufacture. As a naturally moist feed, Chaffhaye minimizes respiratory ailments in animals sensitive to dust or airborne mold spores. The fermentation enriches Chaffhaye with yeast, enzymes and beneficial microflora that aid digestion. Chaffhaye is compressed inside a weather- proof bag that allows for storage inside or out. We proudly grow all alfalfa on our Non-GMO verified farms. Moist & palatable, animals normally eat 100% of Chaffhaye. No stems left behind. Vitamin A Min As Fed* 180 iu/lb. Dry Form* 400 iu/lb. Vitamin E Min As Fed* 45 iu/lb. Dry Form* 100 iu/lb. Because we make a packaged feed we are required to show an “as fed” and “dry matter” basis. The dry matter basis assumes all the moisture was removed. This is presented to help people make a comparison between various feeds, all which have some amount of moisture. The “as fed” takes the moisture into account. The moisture, of course, has no nutritional value, but in the case of Chaffhaye, it’s that moisture that increases the nutritional value by increasing the digestibility and absorption. Feed labels can be very misleading. A product could have a great feed label but if that nutritional value is not absorbed and ends up on the ground as manure, you really haven’t gotten what you paid for.